It's been a while since I carried the secret of pregnancy. Typically when a woman finds out, she is the first and only one to know - if only for a brief time, before sharing the news with her partner or spouse. It can be a time of turbulent emotions too - both joy and fear coming at you. It truly is one of life's best miracles. These days, social media has really upped the game of pregnancy and gender reveals, so when the people at Panorama™Prenatal Screen asked if I'd be willing to share my story and how times have changed in a sponsored post, I agreed. We found out the gender of both of our babies before they were born. I always knew I wanted to find out, because if I was having a girl we were going all PINK - not some mint green and yellow stuff. In they end we were blessed with two healthy boys, both of whom came home from the hospital to blue rooms, moons and stars. But we had to wait a long time to find out the gender, and even then it was luck and technician skill that gave us an answer. I remember bringing my first ultrasound picture (before we knew the gender) to surprise my mom with our big news after we were 12 weeks along. This was WAY before pregnancy and gender reveal ideas on Pinterest! In fact, no one I knew did anything special for revealing the gender of their baby to be. Times sure have changed right?? Look at these great ideas for revealing your baby-to-be's gender on social media! I don't even know which one of these I would choose if I had to do it all over again with today's technology! Having a baby was one of the most exciting and scary times of my life. With my second baby, I was "older" so genetic testing was recommended by my doctor. My husband and I did the research and decided that it was better to go through with it, then not to, but it's a difficult and personal decision for any couple. I couldn't believe it when I heard that with Panorama™ Prenatal Screen, you can get a glimpse at your baby-to-be as early as 9 weeks! Panorama is a DNA screening test that can tell pregnant parents important information about their pregnancy. Like the amniocentesis I went through for my second pregnancy, Parents can find out if their baby is at risk for having Down syndrome or other chromosomal abnormalities. 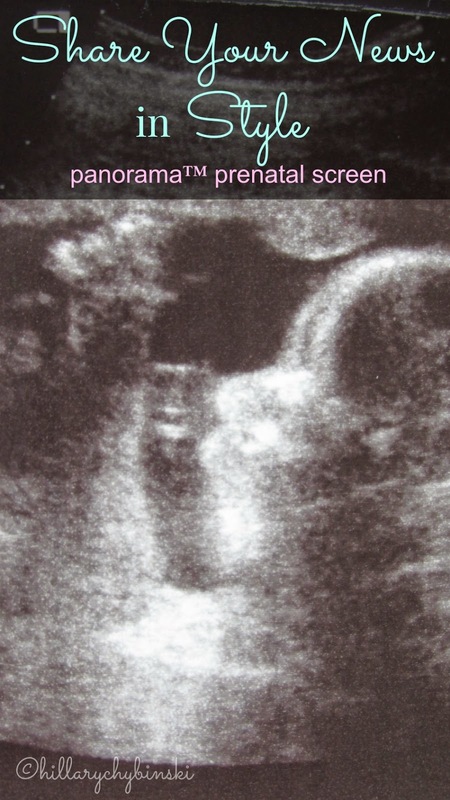 Panorama is non-invasive and highly accurate, with the lowest rate of false positives of any prenatal screening test. You can visit the Panorama website for more information. Who needs a Panorama Test? It's very common for women to be worried about the baby's safety and have concerns about the health of their baby. I used to keep myself up at night with what ifs and worries. If you have concerns, you should talk to your healthcare professional. Some women may choose to have the non invasive prenatal test to help them decide if they want a CVS or amniocentesis. Why choose Panorama? The Panorama screening test is a non-invasive prenatal test and is safe for you and your baby. To have the test done, your doctor just draws a sample of blood from your arm. So if I had to do it all over again today, there are so many changes, I'm not sure what I would choose. I do know I would still want to know the gender of my baby before it was born. I'm also pretty sure that I would want to do one of those fancy gender reveals. Have you done a gender reveal? This is a sponsored post. However, all thoughts and opinions are my very own. I didn't do a gender reveal BUT if I were to do one now I would do it with my dog Finnegan!!! Non-invasive and highly accurate? Sounds good to me!